The first thing we need to cover is the equipment you'll need. This consists of four basic items. Your keyboard, a quality microphone, headphones (optional, but infinitely useful), and the most important thing: you and your voice. The first item, your keyboard, seems pretty obvious. That's because it is pretty obvious. 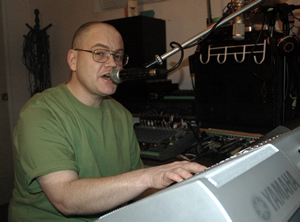 Your keyboard must have a microphone input on it, and it must have a Vocal Harmonizer (VH) in order to do any of this. So much for the "duh!" moment. The second item is the microphone, and this item warrants some discussion. Use a good quality microphone with a directional pickup pattern. Before your eyes glaze over and you go back to watching television, let me explain this in, hopefully, simple terms. As you may or may not already know, not all microphones are useful for all applications. I'll try to keep our discussion focused on microphones as they apply to the VH without going into a detailed explanation of microphone design  a subject that fills whole books all by itself. The microphone property most relevant to our discussion is it's pickup pattern. The pickup pattern of a microphone describes it's ability to capture or reject sounds based on the sound's location in relation to the microphone. Two types of pickup patterns are commonly found in the wild, and are often generically used to describe a whole family of pickup patterns. These two types are uni-directional and omni-directional. An omni-directional microphone is a microphone designed to pick up sound from all directions. This type of microphone is not desirable for use with the VH for reasons to be explained later. A uni-directional microphone, by definition, is a microphone that only picks up sound from one direction only. Despite microphone manufacturer's claims, this type of microphone only exists on paper, as no microphone is perfectly directional due to the laws of physics. Uni-directional microphones include many types of pickup patterns including cardioid (so called because of it's resemblance to a heart shape), super cardioid, figure eight, and shotgun to name just a few. For live performance, and for best results with the VH, we want a quality microphone with a directional pickup pattern  preferably cardioid. We want a quality microphone because the better the quality of the signal going into the VH, the better the quality of the signal coming out of the VH. Sort of like the old computer saying "garbage in, garbage out." We want a cardioid microphone because of it's ability to (somewhat) reject sounds coming from the front and sides of the microphone. This is important for two reasons. Firstly, if your microphone picks up too much of the sound coming from your speakers, you may get a nasty howling sound called feedback. Feedback occurs when the microphone picks up the already amplified signal and feeds it back into the amplifier (in this case the amp in your keyboard). This creates a nasty self-perpetuating loop where the amplifier re-amplifies the signal over and over and over until the resulting howling occurs. Not good in any situation, and especially not good for successful VH results. The second, and most important reason as it relates to the VH, is also because of this ability to reject unwanted signals. One common reason for poor VH tracking is because of too much sound from the speakers leaking back into the microphone. The only sound you really want to be picked up by your microphone is your voice. If the microphone picks up too much of the other sounds (ie: your accompaniment), the VH will be hopelessly confused as to what exactly it's supposed to harmonize, resulting in dropouts or what sounds like distortion. If you are using external speakers, try to separate them from the microphone as much as possible, as this also helps to reject unwanted sounds. As a side note - these are types of microphone pickup patterns and should not be confused with microphone types: the two most common being the condenser microphone and the dynamic microphone. Both types of microphones are available in many different pickup patterns. The type you choose to use will depend on what you want to do, your budget, and personal preference. Generally, condenser microphones provide a cleaner (crisper some may say) sound, but require some sort of external power (batteries or a power supply), and can be more easily overloaded (ie: may distort at high input volume levels), than a dynamic microphone. For most vocalists this overloading is not a problem, but is something to be aware of, particularly if you really like to "belt 'em out" as the saying goes. Dynamic microphones offer (supposedly) increased ruggedness, require no external power, and are much less prone to signal overload. For our purposes, either will work, and as said before, it comes down to your needs and preferences. The first thing to do here is to turn the volume down on your keyboard, set the switch on the back of your keyboard to mic (not line), turn the Input Volume knob on the back of the keyboard all the way to min, and plug in your microphone. Next adjust the microphone level in the mixing console to 85  100. Now turn your keyboard up to a comfortable listening level and try to sing as you normally would while adjusting the Input Volume knob on the back until the green Mic signal LED on the front panel just starts to flash. This is a pain to do, and may require the help of a friend and a little time to get it right. I know the manual says that a solid green indicator is okay, but I've found better VH results with it set to just flash instead of being a solid green. You will have to experiment a little with this. As mentioned previously, the mixing console microphone level should be set at 85  100. You can turn it louder, but there is the risk of feedback and/or distortion occurring. 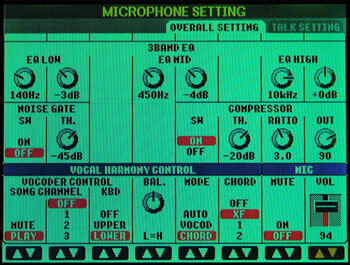 Incidentally, the Mic Vol setting shown in Figure 1 corresponds to the Microphone Volume in the mixing console  there's no need to flip back to the Mixing Console to make adjustments if you are already at this screen. The next group of settings are accessed in the Microphone Setting window. To get to this window, press the MIC SETTING/VOCAL HARMONY button and choose the Mic Setting option on the right of the screen. The first group of settings across the bottom of the screen control how the VH responds and what it responds to. A whole section could be written on this, but in the interest of getting singing and harmonizing, I'm not going to go into the gory details, but instead will suggest some settings to get you started. For our purposes, there are three important settings in this section. The first is the KBD section under the VOCODER CONTROL area. How you set this is really a matter of playing style and preference. If set to UPPER, the VH is controlled by the notes and chords that you play to the right of the split point, and if set to LOWER the VH is controlled by the notes and chords that you play to the left of the split point. I usually leave this set to LOWER as I'm usually playing chords with my left hand, but that's my personal preference. The next setting we come along to is the BAL. Setting. This dial sets the balance between the lead harmony voice and the rest of the harmony voices. I have read many opinions as to where to set this dial, so all I'm going to say about it is that if you see the greater than sign (>) the lead voice will be louder than the harmony voices, and if you see the lesser than sign (<) the lead voice will be quieter than the harmony voices. It is worth noting that the lead voice may not be "your" voice depending on the VH type selected  more on this later. The last setting we are concerned about here is the MODE setting. I used to always leave this on the default AUTO setting, but I have experienced occasional problems with the AUTO setting. The Auto setting is supposed to automatically detect whether the VH type you have selected is a chord type harmony or a vocoder type harmony, but I have found that it sometimes reverts to vocoder regardless of the VH type. There's nothing wrong with the vocoder types if that's what you want, but I prefer the CHORD VH setting for what I do. I have only recently started to play around with the VOCOD setting, so my knowledge is limited regarding it, but I will share with you what I've learned so far. If the MODE is set to VOCOD the harmony only sounds when you play the keyboard and is controlled by the exact notes you play. This is useful if you want the VH to sing a dedicated harmony line or want to switch from two to three part harmony, for example, but it does require some planning and practice. One thing to remember when using the VOCOD setting is that the harmony will stop sounding if you take your hands off of the keys, which may or may not be desirable. You can listen to an example of VOCO by pressing the button shown here. Listen for the addition of each individual voice and the small melody line while I sing the same note through the whole thing ie: the VH is doing all of the note changes. If the MODE is set to CHORD the VH is controlled by the chord you play, not the individual notes  this is a simpler method that does a lot of the work for you because the VH takes care of which notes to sing. This is more limiting musically, but in a lot of cases (particularly for VH beginners) CHORD mode works quite well. Here is the same example using CHORD mode. The chords can be single fingered or whatever type you prefer. This example uses fingered chords to allow me to play the sus 4 chord at the end. As with the above example, I am only singing one note. Both examples use the same VH type  MenChoir with most of the vibrato removed  more about that later. I generally leave the noise gate off because if you have it on and sing too quiet, not only will your harmonies stop, but so will your main vocal. The noise gate can be used, but only if you absolutely need it. It is better to find the source of the noise rather than to try and cut it out with the noise gate. Entire books have been written on compressor settings and what they do, so in the interest of brevity suffice it to say that using the microphone compressor will usually help with the VH tracking as it helps to maintain an even signal level. I'm not sure where I got the settings I'm using (they may be the defaults), but it is worth spending a little time experimenting with it. A word of warning: messing around with the compressor can lead to howling feedback, so adjust it a little at a time to save your ears and speakers. Some trial and error is required with this section as well. Ideally, you should adjust this to where you think it makes your voice sound the best, but there are some other considerations. If you find the VH doesn't track very well, try removing some of the lower frequencies and see if that works any better. I found by much trail and error that the VH responds better for me with less lower frequencies. Two days later I read it in the troubleshooting section of the user's manual  Doohh!! Again, be careful when adjusting the EQ and use small changes  cranking up too much of a frequency may invite our old friend feedback for a visit. For my voice and mic, the VH tends to track better with less 140 Hz and less 450 Hz as per Figure 1. Don't be afraid to experiment here as this section has quite an effect on how well the VH tracks your voice. This seems particularly true when singing along to a midi file or to your own accompaniment (especially when using a noisy or busy style) while using speakers instead of headphones. Another factor to consider might be whether you have a naturally high-pitched voice or a naturally low-pitched voice. I say "might be," because I have a higher voice (of which I'm quite familiar with), not a lower bass type voice (of which I'm not familiar with) so I haven't any experience here  this is only speculation and opinion. It's been my observation that some VH types sound better when higher notes are sung as opposed to the really low notes. It's sort of like playing a "C" chord in the middle of the piano, and then playing the same chord at the bottom of the piano. The chord played at the low end sounds muddier and less distinct. I guess what I'm trying to say here is that low notes may sound muddy or distorted when harmonized with certain VH types. If you have a lower voice and find this is the case, try some of the VH types that harmonize using mostly higher notes. Std Duet, HighMaleQua, Sing B+G, and CntryGirls may be good ones to try. Don't be afraid to experiment to find what works for you. Dan singing and playing his Yamaha. The VH is an instrument all by itself, and like any instrument worth playing, some forethought and practice are required to get the most from it. The most important factor to consider is intonation. You have to be able to sing at least close to in tune, or you may be disappointed with your results. Many VH bobbles and distortions are caused by hitting the note slightly out of tune and then sliding into tune, or by hitting the note in tune and then drifting away from the correct pitch. These problems are both natural and common for many singers including your's truly. A lot of the singing techniques useful for the VH are just plain useful singing techniques. Breath deep and support your singing with your diaphragm (the muscle between your stomach and lungs). This will help you to relax, and the support from your diaphragm will help to keep you in tune. Keep your head up and shoulders square, if possible - no slouching. I find I sing the best when I stand, as I tend to slouch and hunch over when I sit. Standing isn't practical when I play the PSR (too many pedals), so head up and shoulders square is a good compromise. I also find it useful to think of the voice as an instrument sitting on top of a column of air. If the column is soft and lopsided, the voice will slide off the edge of the column ( ie: go flat) and fall on the floor eventually. It also helps to visualize singing the note from the top down as opposed to the bottom up. Most people's natural tendency is to sing slightly flat and slide up to the proper pitch. Visualizing singing the note from the top instead of the bottom helps avoid this. I'm not sure that makes sense, but it's how I picture it, and it does help. I have no formal vocal training, but the breathing, diaphragm, tuning and other things also apply to playing a wind instrument. In this regard I do have a fair amount of training. The VH also doesn't respond well to sudden changes in volume (try to be smooth), and if you like to shout when you sing, you may also be disappointed. I guess what I'm trying to say here is that singing with the VH requires a controlled, smooth singing style for best results. Another point of interest is where you sing into the mic. Every microphone I've tried (including headset mics) has a definite "sweet spot" in it. What I mean here is that the VH tracks and responds better when you sing at a certain distance/position from the mic. With some mics the sweet spot is an inch or two away, and with others it may be right up close to the microphone or even a bit to one side. Once you find this sweet spot, it is useful to try and stay in it whenever possible. Again, this is a large subject that could warrant it's own article. For our purposes, I'd like to limit our discussion to some of the more common ones, and some tweaks that you may or may not find helpful. In my own personal scheme of things, I think of the VH as consisting of two main types. The first type leaves your voice alone and only reproduces harmony voices, and the second changes your voice in some way while reproducing the harmony voices. An example of the first type would be Std Duet and an example of the second type would be SistersTrio. In Std Duet, the lead voice is your voice, unaltered by the VH. In SistersTrio, the lead voice is still yours, but it has been changed by the VH to sound more female (Yamaha calls it gender change). This second type of harmony can be difficult to use for a beginner because you can't really hear your own voice, just the changed version. For this reason I suggest that you start with a VH type that doesn't modify the lead voice until you gain your "VH legs." Some of my favorite VH types include Std Duet, MenChoir, MixAcapQuar, MixedChoir, and SistersTrio. Without a doubt, Std Duet is my personal favorite. SistersTrio is particularly useful for background oohs and ahhs, and actually sounds pretty nice without any tweaking. Okay, we've got our mic plugged in and our keyboard setup. It's time to sing something. I suggest that at first you should try one of the simpler VH types, and that you practice a bit with only chords and no style playing. Another extremely useful thing at this stage is a pair of headphones. Using headphones allows you to focus on your singing and has the added advantage of eliminating any noise leakage from the speakers into the microphone which may cause unwanted trouble. A good VH type to start out with is Std Duet. It is a simple two part harmony VH type, with you singing lead and the VH singing a harmony above you. I suggest this VH type for a couple of reasons. The first reason is that this VH type doesn't alter the lead voice. The lead voice with this VH type will be your own voice, and may eliminate the "I tried it but couldn't stop laughing because I sounded like a chipmunk" syndrome. Until you get used to singing with the VH, it is important that you be able to hear your own voice unchanged by the VH. It's difficult to tell how you are singing if your voice has been altered by the VH in some way (ie: gender change or octave shift). The second reason that this is a good VH type to start out with is because there is only one harmony voice. Starting with a full three-part harmony VH type can be discouraging because when it mis-tracks, the resulting "harmony" sounds like a cross between distortion and really bad yodeling. Std Duet doesn't sound great when it mis-tracks either, but it's easier to tell what's going on because there are only two voices singing as opposed to four. One last tip, from another post of mine, that works well when recording. If you sing a note or sustained phrase with the VH off and switch it on while sustaining the note or phrase, there is a noticeable dropout as the VH switches on or off. Kind a like laaa "hic" laaa. Another method you can use to eliminate dropouts is to use the vocoder mode. A little more thought and practice is required, but it has the added advantage of being able to be used for live performance, not just recording. It is worth noting that if you choose UPPER for vocoder control, you may or may not want to turn down or mute the Upper voices depending on the desired effect. Well, that's what I think I know about the Yamaha On-Board Vocal Harmonizer. I hope some of these ideas and suggestions will help you to improve not just your work with the VH, but with your music in general. One of the best things you can do is to practice with headphones on and only chords playing. Once (if) it starts to come together, gradually turn the chords down (for A Capella-style harmonies), and keep practicing. Or you can pick a style and continue you VH exploration by singing along while a style is playing. If you run into trouble, go back to singing with just chords and headphones for a bit, and then try again. Like anything worthwhile, practicing helps.